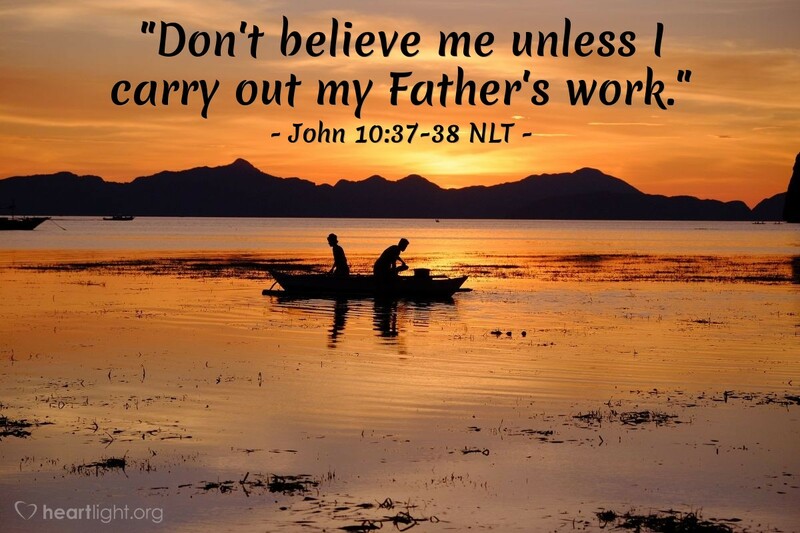 [Jesus said,] "Don't believe me unless I carry out my Father's work. But if I do his work, believe in the evidence of the miraculous works I have done, even if you don't believe me. Then you will know and understand that the Father is in me, and I am in the Father." As Jesus says several times in John, "Look at my work and you will know whether I am telling the truth or not." The issue isn't just Jesus' identity, but also our honesty and desire to honor God. The truth about Jesus resonates in the hearts of those seeking to find God and know him. Jesus' actions and his words call us to believe him. If we don't fully believe him, we are rejecting him and effectively belittling him. There is no middle ground. We must look at the way he treated people, the things he taught, the way he lived his life, and the great works he did and then decide: Is this the work of a mad man, or is he the Messiah from God? Is he the Son of God come in human flesh? Father, I thank you for making yourself accessible to me through Jesus. I know you are ever near, but Jesus' life on earth somehow makes your nearness even more real and personal to me. Thank you for loving me so much in Jesus, in whose name I praise and thank you. Amen.